Amazing beach front & ocean front duplex sleeps up to 30 comfortably! Beautiful sandy beach with great swimming & fishing. Very low density beach with no condos or high-rises anywhere on this beach. Great sand dunes with classic picturesque beach grass and sea oats. Deck, balcony, and sitting & sunbathing deck. Canopy shaded area at the end of the deck over the dunes. Weekly rates include linens, towels & cleaning! Keywords: Duplex House On The Beach! Linens provided with rental of one week or more. This beach house sleeps 30 comfortably. There are 2 kings, 4 Queens, 4 Queen size sleeper sofas, 4 twins and 6 high quality twin size air mattresses. This was our second year at Carolina Dream- a couple weeks later than last year. The weather was perfect and gave us lots of opportunity to enjoy the beach which is right outside our doors! The house was well maintained and had all we needed for a large group (up to 30 at one time) to enjoy reuniting and recharging our batteries. The hot tubs were used every day, multiple times per day. Last year the walkway had caused some issues for some of the kids with bare feet, this year the deck and walkway was completely replaced with new wood and there were no issues at all. The maintenance man stopped in to check on things and everyone we dealt with from initial contact to final return of deposit were friendly and helpful. I would highly recommend this house for large groups looking to enjoy time together with all the comforts of home. We rented out the entire house and it was the perfect size for all 18 of us. Kitchen, living room, bedrooms were all in great shape. The back deck and walkway to ocean was incredible, you cannot beat this location. The downstairs den was relaxing with the hot tubs and picnic tables. Had no issue whatsoever getting the security deposit back. Overall, great experience and will come back! Please read before staying here! It is beyond me as to why this house has such a high rating. We stayed here last year - in 2016. 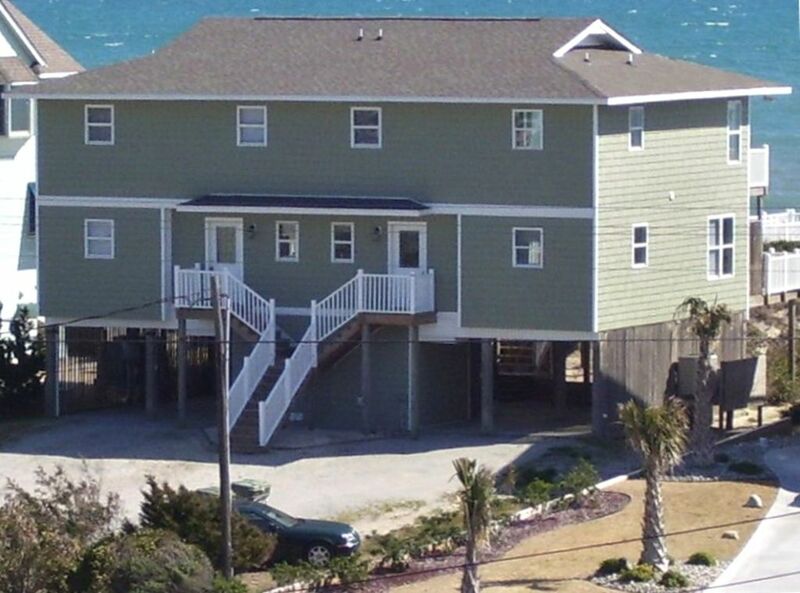 It was the worst house we've ever stayed in at Emerald Isle. We have been coming to Emerald Isle for years, and last year we had a tighter budget than normal, so we thought this house would be a great choice for us. Upon arrival, we realized there was mold ALL in the showers. I went to the dollar general near by and bought bold and mildew remover. We had to scrub the showers before we could use them! The entire house had areas in the corners of the walls, the steps, floor, and even an area on the sheets of the bed that was not clean. The toilet upstairs was leaking and they had a small bowl collecting the water drip. The coffee pot was broken, and if your like us- a good cup of coffee on the back porch watching the sunrise is so relaxing while on vacation. So, we bought a coffee maker from Wal-Mart. All these things we just brushed aside. Then... the other guest arrive on the other side of us. The guest beside us informed us they were going to have a wedding on Friday.. on "their/our" back porch. The owner of the house never informed us that the other side of the house was rented out for a wedding. To be considerate to the other side, we cleaned our area of the porch on Friday. We moved further down on the beach so they could have their ceremony right off the walkway on the beach, we shared our picnic table for all of their guest, and tolerate the wedding party they had after the ceremony...but everything was fine. However, it would have been considerate for the owner to let us know ahead of time that there would be a wedding ceremony going on right on our walkway. Even after this.. no big deal. We enjoyed the beach and our family. On the last day, my mother spent an hour after we loaded up the vehicles, picking up and cleaning the house so we could get our deposit back. She swept, cleaned all the bathroom showers and sinks, tidied up all the bed rooms, kitchen, outside areas, cleaned the back porch so there was no sand on the porch or chairs, and even placed the pillows perfectly neat on the couches. We left that house MUCH CLEANER than it was when we arrived. It took my mother months to get her deposit back and then when it arrived the owner took $75 out of the deposit stating "the house was left unkept and in disarray" She called the owner and spoke with his secretary, which was the sweetest lady, but the owner never called back. Reserved the entire house for a week with a group of friends. Location was perfect, right on the beach and you can't beat the view from the bedroom or deck. It was beginning of off season so we had the beach practically to ourselves. The house was fully furnished for all our needs and very comfortable. The pass thru door made it convenient for visiting back and forth without having to go outside. Definitely will do this again. Great for a Reunion! Beautiful Beach! This is the 6th year I have been to this duplex. A group of us quilters go for a week of relaxation and have been extremely satisfied with our stays. The owner has updated bathrooms and furnishings regularly and has responded quickly and politely any time we had any questions. We are very pleased to have the linens furnished without extra cost so we don't have to bring any from home. We particularly liked the connecting door to the units as we went back and forth often. All beds were comfortable and clean and there are plenty of pillows and blankets, if needed. We are looking forward to going back again next year. Go carts, bumper cars and bumper boats.